For over 20 years, Sticky Tongue Farms has been family run and absolutely obsessed with reptiles! Sticky Tongue Farms broke new ground by becoming the first company to ever offer a Vitamin D3 free calcium supplement for carnivores, herbivores and insect eaters kept outside, and has coninuted to provide the very best mineral supplements for pet herp breeds to this day. As herp owners and breeders themselves, the experts at Sticky Tongue know just how to produce an ideal life for pet reptile breeds. After years of people with herps raving about how well Miner All worked, Sticky Tongue Farms knew they had a hit on their hands. Their flagship multi mineral supplement, Miner All has for years been the go to supplement for owners of insect eating reptiles and amphibians. It is scientifically formulated with over 50 vital minerals and calcium to ensure optimal bone strength. 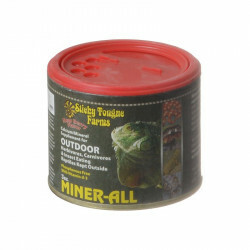 Miner All is available for both indoor and outdoor herps, and specially designed to meet the needs of each type of animal. Pick up some Sticky Tongue Products today youll be doing your herp a favor. Our Sticky Tongue Farms store features products to meet every herp owners needs. Miner All multi mineral supplements provide your herp with essential nutrition to improve bone strength, immunity and overall health. Pet Mountain is proud to offer you a wide selection of Sticky Tongue Farms products, at the very best prices available anywhere! Take a look at all of our huge selection of great deals! Cant find something youre looking for? Let us know! Wed love to help. Be sure to check out our online coupons and discount shipping on all your favorite products.